The beautiful area of St. Cloud holds a rich and unique history dating back into the late 1800s. Strangely enough the vision for developing the region came from Hamilton Disston during repeated fishing trips to the area during the 1870s. During the time Disston communicated with Florida’s Internal Improvement Fund, and was awarded half the land now known as St. Cloud by draining the swamps and building canals. Between 1886 and 1887 Disston constructed a sugarcane plantation, named St. Cloud. In the next few years Hamilton would open railroads and roadways giving access to the area, and clearing land for the construction of the new city. On April 16th 1909 the city was unofficially announced as the “New Town of St. Cloud,” by the Kissimmee Valley Gazette. It was however considered to be a “Soldiers Colony,” and as the city began to boom the streets that were built were named after the states that the veterans had come from. Because of the regiments the soldiers had come from the streets that were perpendicular were named 1st, 2nd, 3rd and so on. These streets can still be seen today when you are passing through the city of St. Cloud. When U.S. 192 was built crossing through the center of St. Cloud widening the thirteenth street it brought with it tourism and an economical boom. 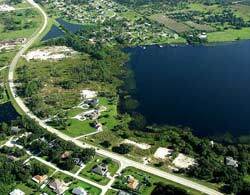 Because of its location on the southern shore of East Lake Tohopekaliga or Toho for short it has a lot of lakefront properties. Because the city is built on a grid it is easy to find your way around town, and the downtown area is located in the center of town just a few blocks from the lakefront. On the southern side of Lake Toho the city of St. Cloud built a beach, two piers and a fully functioning marina. 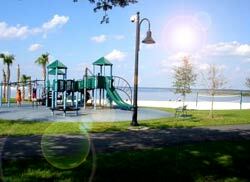 In the past few years construction was underway to clean and replace the lakefront attractions and the marina. A large building was erected and filled with a local restaurant as well as a dining hall for rent. The marina was completely redone offering more boat spaces as well as a temporary dock and two boat launches. Next to the existing playground (Which was also replaced) a large water pad has been added allowing kids of all ages to cool off during the day. 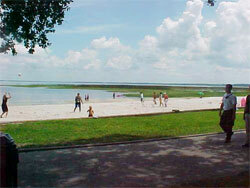 The large lakefront beach is the perfect way to spend the weekend in the area! The great part about the city of St. Cloud is its size. While it only consists of 6,716 homes it houses over 20,000 happy citizens, unlike the other cities in the area it has retained its small but great size. This means that unlike other cities properties are large and privacy is in abundance. These oak covered streets and beautiful colonial homes stand in great contrast to the new subdivisions, offering a wide variety of houses in all shapes and sizes. The location of St. Cloud is perfect; it is just outside all the hussle and bussle of Central Florida, while only being a short distance away from all the business and entertainment. Being just a short drive away from Kissimmee and Orlando you are just a half hour away from the Walt Disney World Resort entrance, the Universal Studios Theme parks and of course Sea World. 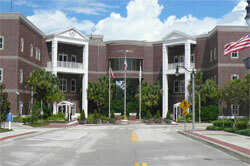 With so many other attractions and entertainment in Central Florida the city of St. Cloud is within range of them all, and is a great place to live if you want to avoid the main hub of tourist activity! Right along U.S. 192 or Thirteenth Street (Both are the same) you can find most of the main shops and restaurants. With a Public, Wal Mart, Home Depot and much more you can find all your needs and necessities just a short drive away. One of the most prominent buildings that you will see while driving down the U.S. 192 is the First Baptist Church of St. Cloud. The current pastor of the church is Pastor Steve Rymer, the Youth Pastor is Chris Bacon and the College Group Leader is Bill Johnston, who also happens to be the Fire Chief of the St. Cloud Fire Department. The church just recently celebrated its 100th year of service to the community! The area is home to seven separate Elementary schools, two Middle schools and two High schools, as well as multi-level and private schools. Depending on where you live your child can be recommended to a school or zoned for one. These great schools have won awards over the years for their education and student participation, ensuring that your kids get the education they need! Central Florida is one of the fastest growing regions in all of Florida, primarily attributed to the ever popular theme parks and entertainment. Because of this St. Cloud has seen an explosive growth over the last few years, and is projected to continue growing. With the recent construction of developments the houses here are poised to go quick as the area continues to expand at an unprecedented rate!